The majority of sighted people are unlikely to contemplate, let alone understand, the difficulties that face blind and partially sighted people on a daily basis. 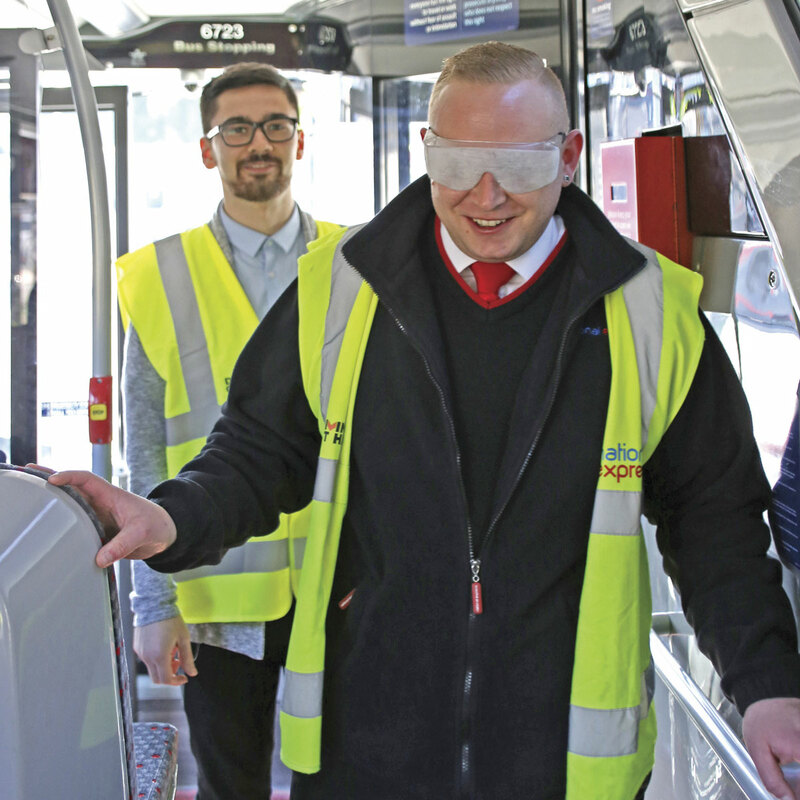 Public transport can be a particular challenge and the RNIB (Royal National Institute of Blind People) has been working closely with operators to develop a Bus Charter in support of ensuring blind and partially sighted people can travel independently. The Bus Charter sets out their expectations for the bus driver, the vehicle environment and other parties. 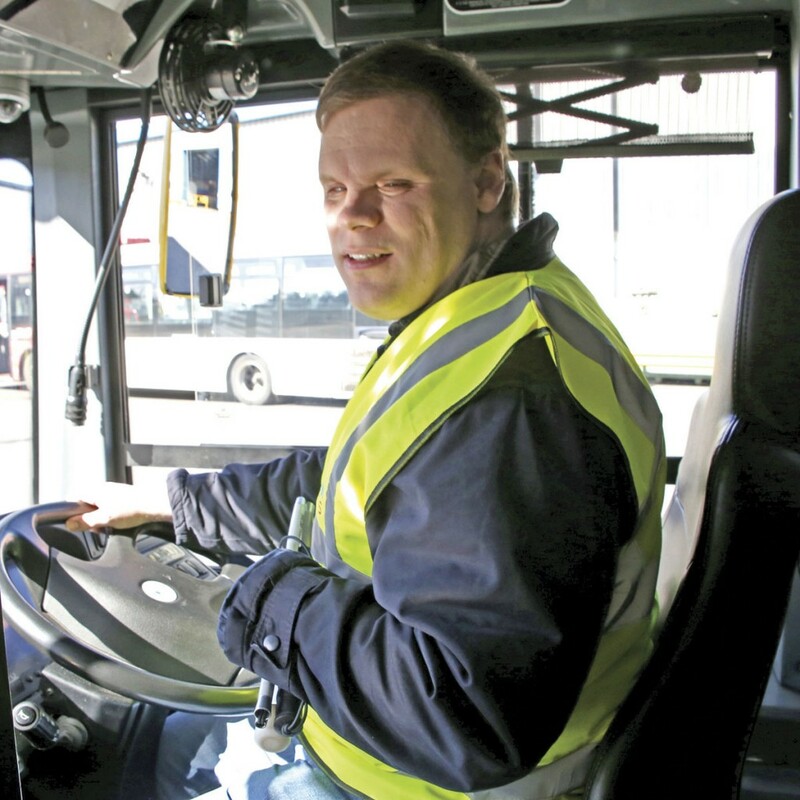 It follows much of the best practice developed by the industry in respect of disabled travellers and used by many organisations as part of their initial driver training and subsequent driver CPC modules. To mark the signing, National Express hosted a ‘Swap with me’ event at their Training Headquarters in Walsall where members of the driver training team used sim specs to swap places with blind and partially sighted people and learn of the difficulties they experience with boarding buses, ticketing and finding a seat. 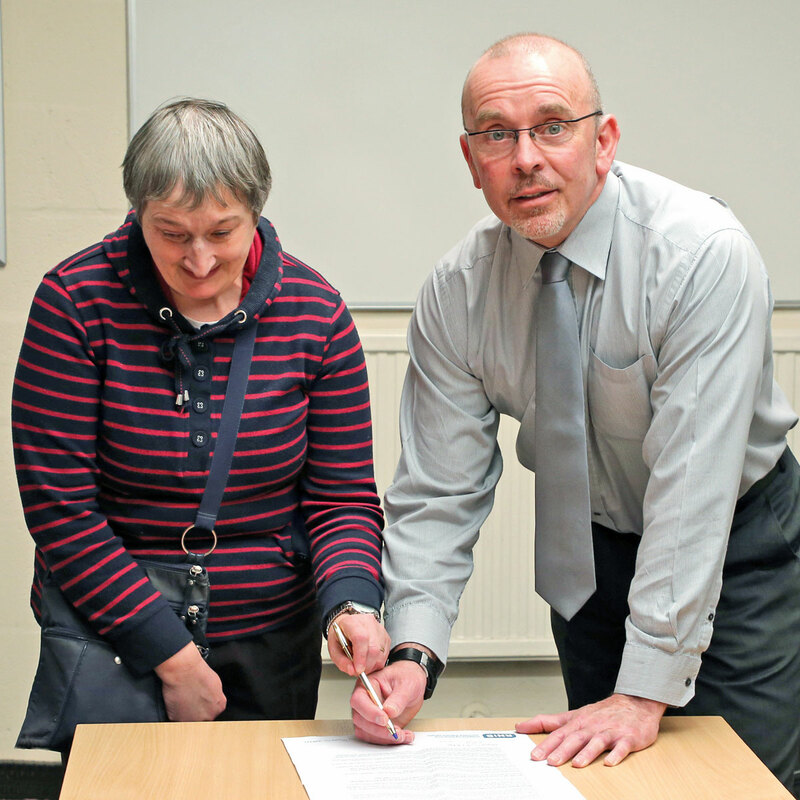 A wide range of visual disability was present in the invited group of blind and partially sighted people who were all active in disability consultation bodies under the auspices of the West Midlands Combined Authority (WMCA). 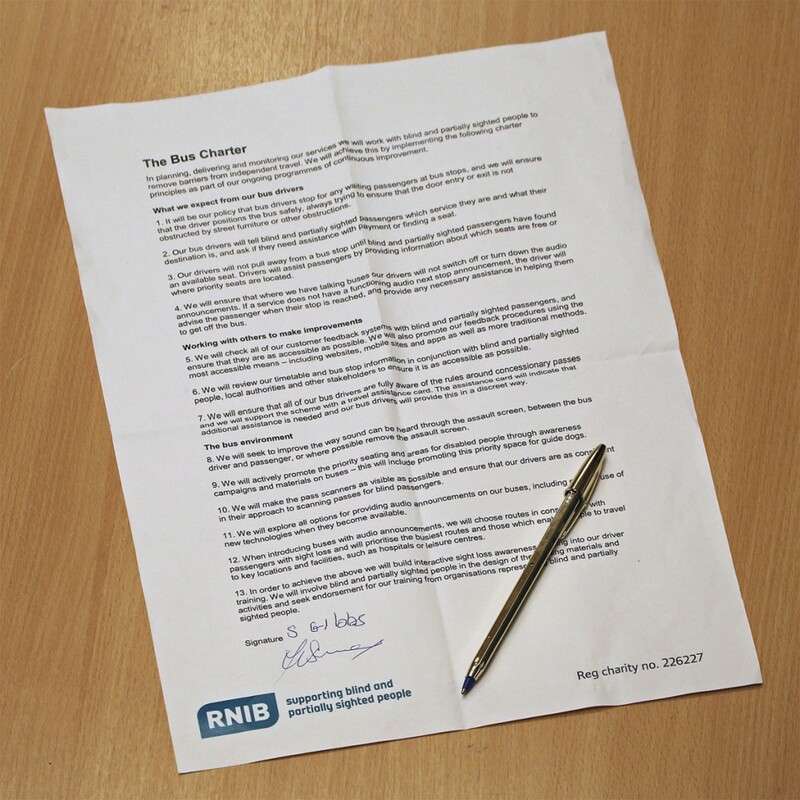 Welcoming those present, RNIB National Campaigns Officer for Transport, Natalie Doig, was pleased to report that the operators of around half of the UK’s buses had now signed up to the charter. She also praised the work of the local blind and partially sighted bodies who work tirelessly to make things improve for people with sight loss. Natalie then turned her attention to the mobility aids that blind and partially sighted people use, cautioning that large numbers of people with visual impairment choose not to use any mobility aid. 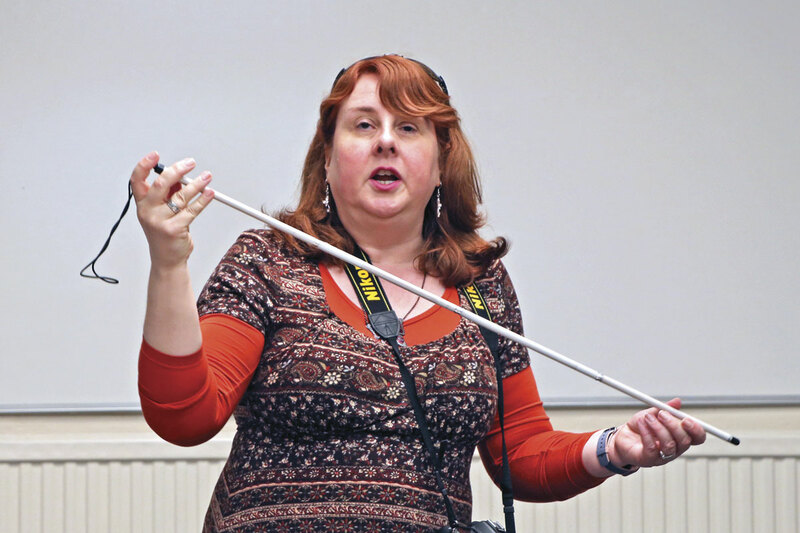 At its simplest, a thin ‘symbol’ cane is carried to alert people to a visual impairment, this is usually white but other colours are used, the different way it is used compared with a walking stick being a means of identification. Red stripes are used on a white cane to symbolise that the person carrying it is deaf as well as visually impaired. The group then moved outside to the extensive parking area used by National Express West Midlands for training. Here, two ADL Enviro400 MMC platinum double deckers were provided in a safe environment for the visually impaired people to sit in the cab and welcome drivers wearing sim specs aboard. The sim specs used demonstrated a variety of conditions including cataracts on one or both eyes (effectively very little resolution), glaucoma (like a curtain on one side), macular degeneration (broken up image) and pin hole vision. A BBC crew filmed extensively inside and outside one vehicle, selecting a number of participants to appear in an extended report which appeared as a lead item on that evening’s Midlands Today news programme. Other participants took it in turns to board the second bus, most of the driver trainers experiencing some difficulty. Karlton Edwards from West Bromwich depot tried the both eye cataract sim specs and after a bumpy boarding said, ‘I know the layout of the buses well but I still found it very difficult getting on and finding a seat.’ With specs simulating glaucoma giving only a small amount of vision on one side, another participant said he found it difficult to find the right place on the ramp to board the bus and was constantly double checking that he was not about to fall off the edge. The event was made more challenging by the bright sunshine which significantly increased the light/dark contrast within the vehicles. The resultant glare was also noted as a real issue for a participant with pin hole vision. 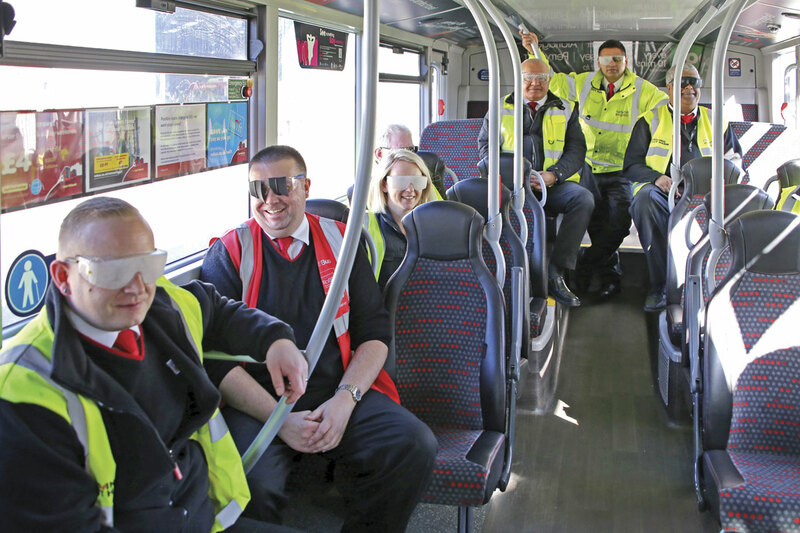 An excellent on board discussion then developed on the second bus as the driver trainers and the blind and partially sighted participants exchanged experiences. Campaigner Paul Bryce who has been blind since birth, amongst others, spoke of the difficulty caused by the varied vehicle layouts chosen by operators. Issues such as the positioning of card readers, ticket machines and priority seating were discussed. Several participants found the level of handrail contrast on some vehicles quite low although National Express Bus pointed out that the bell pushes on the handrails in the Platinum vehicles had been increased in contrast and also had a braille message on them. 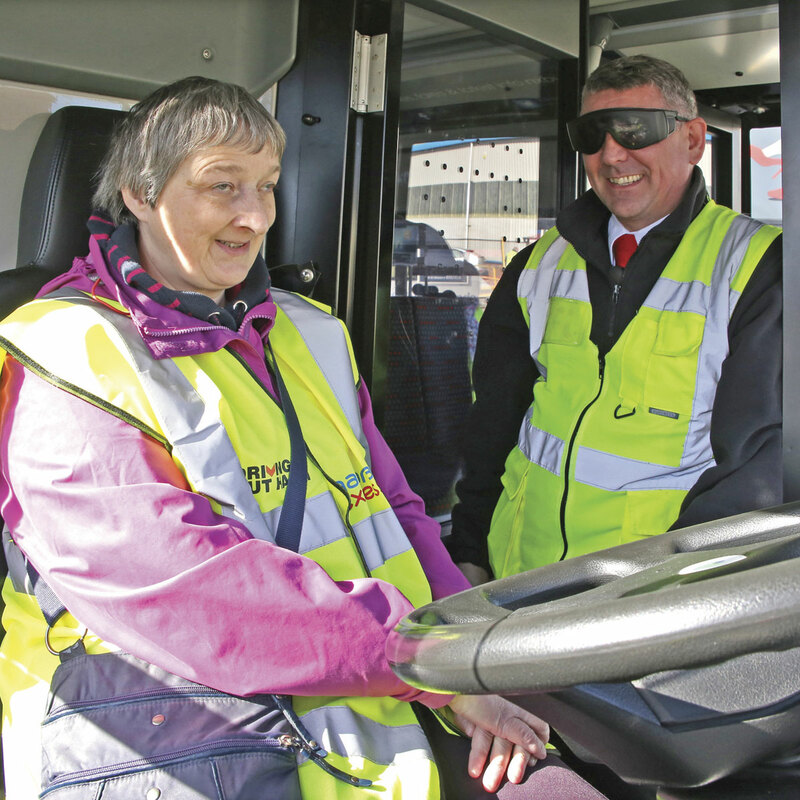 ‘Talking buses’ were another area of discussion, generally being considered a significant step forward although it was suggested that drivers needed to be aware of their status and advise visually impaired passengers if messages were being delivered out of step. For those with the ability to use mobile phone technology, some of the apps available or under development could provide assistance. One that was awaited with anticipation was an app by which a partially sighted person unable to read route or destination information could ‘advise’ the bus which he/she required. This was particularly important where more than one bus arrived at a stop at one time (referred to by participants as ‘stacking buses’) and not the bus actually at the defined stopping point was required. A bus hailer board is currently available for blind and partially sighted persons to use at stops but is considered by many as difficult to carry around. The question of the impact of noise or lack of it also arose in a number of contexts, from being able to hear what a driver was saying through the cab screen to the lack of noise from approaching hybrid and electric vehicles. Reconvening in the training centre, all participants declared the event to have been a very worthwhile experience. As indicated by Mark Simcox previously, National Express West Midlands will be communicating the commitment to the Bus Charter across its depots and RNIB will report back at a later date on the experiences of blind and partially sighted persons using National Express buses. Bus and Coach Buyer will also be looking in more depth at the work RNIB does and the content of the Bus Charter in a future report.